Well, it's the missing section of M42 at the southern end; the bit that connects to the M5 northbound. Yes, you're quite right - however that wasn't the original idea, which is why the parts of the junction that head towards the north opened quite a lot later than the connections to the south. OK, so what was it? Well, the M42 was meant to split into two at the southern end, with one link heading to the current location of the M5/M42 junction, but with sliproads that only allowed access to and from M5 to the south. The junction between the two halves of the motorway was to be located about 1 mile to the east of the present junction 1 with a simple fork junction meaning that no-one could travel between the two links. This must have been very disappointing for the local hooligans, who were then unable to plan spending their long summer evenings setting new Catshill Orbital lap records. What a shame for them. Perhaps not surprisingly, the present junction 1 would not have existed in the original plan, although some commercial maps do show its presence. Are you actually going to get around to describing the missing bit? Yes, of course you are. Silly me. 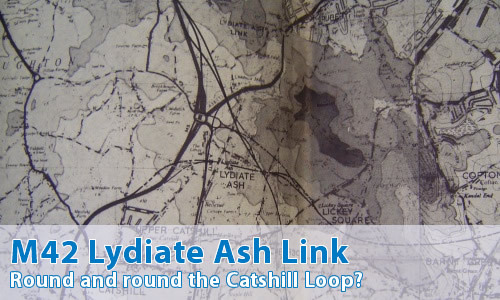 OK, the Lydiate Ash Link would have met the M5 a little to the north of the present junction 4, and would have continued straight where the M5 curves away. There would then have been a connection to J4 itself, to allow A38 traffic to gain access to the motorway that way. Oddly to modern eyes, the missing section is referred to as the mainline in documentation, whilst the present section is referred as "Catshill Link". The line commences at the M5, just north of the Lydiate Ash Interchange, crosses under the A38, passes to the north of the properties on Alvechurch Highway in a cutting maximum depth 60 feet, before passing through the sand and gravel works at Marlbrook and the resultant tipping areas. The length from A38 to B4096 Old Birmingham Road would ultimately be in cutting and noise intrusion would be restricted. From the B4096 at Lickey Rock the line passes in a southerly direction to Brookhouse Road, entering the sand and gravel works at Shepley where it connects to the motorway link from Catshill. Why did it not get built? Oh, the usual. This was the mid-1970s, and road schemes were being cancelled or delayed all over the place. Nothing terribly surprising. Perhaps the most surprising thing of all was the sheer scale of the plans. If you take the whole complex as one single interchange (which it effectively was), then the total distance within (including the M5 section) is just over 6.5 miles. To put that into context, the large M5/M6 interchange at Ray Hall, northwest of Birmingham has a total roadway distance of about 3 miles. Can I see a map of the route? The M5 between junction 3 (the A456) and the M50 was originally built with only two lanes. South of the now M42 junction it was widened to three lanes as far as the M50. To the south of junction 3 a third lane was only provided as far as a point on the steep hill about a mile north of junction 4, with the southbound hard shoulder being temporarily used as the exit lane for junction 4, thereafter dropping a lane to become two lanes only as far as the southbound entry link from the M42. That obiviously was intended to be the start point of the missing M42. When the proposed link was abandoned and the substandard northbound links provided in their current location the remaining narrow (two lane) section of the M5 had to be provided with a third lane. The existing two-lane overbridges bridges at junction 4 were not rebuilt, the third lane was shoehorned in beneath them at the expense of the hard shoulder through the junction.